Wit's End: Koch Kills on the Ed Show! 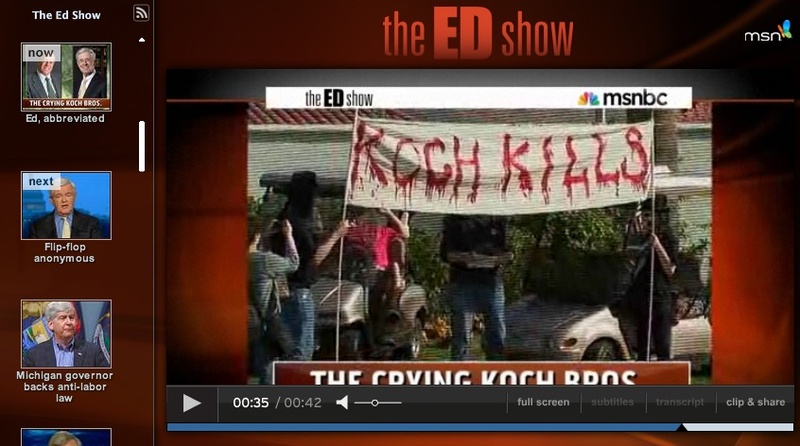 Koch Kills on the Ed Show! After a commercial and some brief clips, Ed leads into the "Crying Kochs" with "...poor little rich boys, the Koch brothers, don't like all the negative publicity...get used to it, fellas - just like your refineries, politics is a dirty business!" The Wit's End post on the Weakly Standard interview with the Kochtopi is here. Below is the quick clip that has the shot of the Koch Kills banner. You are so vanguard ! has a poll which, if you take, will get you a free subscription to their upcoming videos. The Worst Thing The Koch Brothers Have Done. The comments certainly outdo anything I'd ever come up with. I curate therefore I am! RAGE - I'm just furious!